I admit it. After Comic-Con, we got swamped by the pressures of real life. Five days of feeling like we belonged, and we’re still paying for it almost four months later. Luckily, many of the people we talked to in San Diego graciously followed up with us, and let Fanboy Planet take a look at their projects. In the case of creator Parker Smart, we should call it his life. Parker has devoted the last few years to launching his own comic book, pouring all his spare time, energy and cash into seeing it come to life. For Fanboys, he may be doing the unthinkable to keep it alive: selling his action figure collection. So far, however, it looks like it may be worth it, as Parker Smart’s CiCi sees its third issue getting a release on Wednesday, November 13. Parker contacted us shortly after San Diego, and after I read the first couple of issues of CiCi, I felt like I understood enough to conduct an interview with this guy with a dream. Derek McCaw: Let’s get your plugging out of the way: Tell the readers of Fanboy Planet why they should be reading your book. CiCi is a clone. She was duplicated from the original, Cynthia Christiansen, who was scanned using nanotechnology called nanenes (Nano + Gene). This scanning process stores every cell position and her entire body structure into a VERY large database. CiCi is created using a reverse process, using a new batch of nanenes that construct her atom by atom. She is an exact duplicate with all the memories of the original Cynthia. The technology that created CiCi was mistakenly left inside her and she was deemed a failure by her creators, Mile High Technologies. Cynthia comes from a very religious background and when CiCi finds out that she is indeed a clone and how she was created, this is what sets her off and makes her think about life and her existence. If she was created by these tiny machines, how could she possibly have a soul? Or does she share a soul with Cynthia and all the other Cynthias in stasis? If she feels that she has no soul then how could there possibly be a God? So CiCi’s beliefs crumble as she finds out more and more. My main goals for the comic book are to entertain as well as educate and make people think. I see so many comics talk about nanotechnology and it’s very brief. The text might mention a nano-virus and then keep going. In the true spirit of science fiction there is some science behind this work of fiction. Plus I’d like for the readers to think about this type of human cloning and not just growing people from embryos. I’ve tried to keep my text brief so I wouldn’t cover up all of the gorgeous artwork. If you want your hand held through a comic or a series then this book isn’t for you. I would like to continue writing and publishing, so go out and buy the book. Derek McCaw: What was your background before creating CiCi? Parker Smart: How far back do you want to go? I was born January 27, 1967… Oh wait. Not THAT far back, eh? I’ve always been drawing things since as far back as I can remember, but I’m a product of the computer age. I grew up in Hawaii so I was exposed to all kinds of video games either from the “mainland” or from Japan. I forget what game I saw first, but it didn’t matter. I was hooked. I wanted to know how that stuff worked and read all I could about this magic coming from this big clunky box sitting in a dark game room. I started programming in high school on an Apple II or TRS 80. This was so much fun because I could create my own games and animation. I continued to enhance my skills in college at the Colorado School of Mines which is a prestigious engineering school that sits about six blocks away from Coors in Golden, Colorado. Mines gave you so much work that thinking of beer wasn’t even an option if you wanted to do well. After graduating Mines in 1989 I headed to Huntsville, AL to a company called Intergraph. The work I did there was amazing. I had my own UNIX workstation and helped create a Windows like environment for these workstations. I got to learn about so many other platforms as well since Intergraph wanted to move their software to the XWindows environment. Not only did I have access to the Intergraph systems, but also HP’s, Sun SPARCstations, and Silicon Graphics workstations as well. It was a lot of fun because there was always some little side gaming project that somebody needed help with. Of course the games truly tested the extents of the hardware and the network. I’ve also worked with graphics on PC’s as well. When I moved back to Colorado I ended up writing financial software. This package graphically showed clients how well (or poorly) their investments were doing. And that was a pretty good gig while it lasted, but as for many companies that don’t actually sell their software to create a revenue stream you have to make big dollar cuts in order to make your bottom line look better. You really need to have those sales in order to be successful. In the trust banking business it’s hard to convince people that they need to change. Since the trust people weren’t budging then the layoffs occurred in January. What inspired you to turn to writing a comic? I’ve always dreamed of being published. But of course in hindsight I thought it was going to be a Math or Computer Science textbook. I took a creative writing course at Mines and I actually got one of the few A+’s in the class. Maybe I was the only one. I wrote some pretty good stories in the class and they were all science fiction and dealt with computers. The other students in the class liked my stuff and I thought they were pretty cool. I continued to write even while at Intergraph and many of the stories were inspired by those botched Star Trek “transporter” events. My first stories were about the clones that were created, and what went through their minds when they found out that they were the clones and not their “original” selves. Many stories used those “The Fly” pods to create the clones. Both the clone and the original could see what happens when you walk out and look over at the other. There’s that instant sense of self anxiety knowing that you’re not the original. In some the cases the original might have remorse for the other, but that’s really not his problem and he is able to continue a normal life. The clone undergoes a deep depression when in a lab setting, but in CiCi’s case there is so much going on that she has only brief moments where she can contemplate about her existence. I also wrote a few stories about somebody that was religious and this made things more interesting. I started reading more about genetics and nanotechnology and wrote more stories that integrated the nanotech. I didn’t get inspired to write a comic book until I became a fan myself. (That’s a whole ‘nother question isn’t it?) I fell in love with the medium and thought that I’d like to turn my stories into a comic series. I loved the fact that you can drive a point home with a single picture and an expression, but you can also write about something supportive or something completely different. Derek McCaw: You’ve mentioned that CiCi was a long gestation period. And, in an earlier conversation with me, you mentioned that you had been criticized for the artwork looking so “old-style Image.” Are you still hearing that, and what’s your response to such criticism? Parker Smart: I can’t really respond to them that much. Most of the reviewers don’t allow for a rebuttal. I would have to agree them though. The artwork in some places was inconsistent. All in all it flows well, but when I put on my editor hat I don’t see a consistent style in some of the panels. Some of this comes from three different artists, but in the later series you see changes in the primary artist’s style. I had hoped that a single inker would smooth everything out and it would flow together more coherently. But of course I ended up having three different inkers. The same thing with the colors too. It was hard to keep people because they had other projects to work on and different agendas. Derek McCaw: Do you see CiCi as a limited series, or do you have ongoing plans? How far do you intend to take this? Parker Smart: I would love to continue to create an ongoing series. Right now it depends on sales. I’m definitely not made of money, so there are finite funds to put in to the project. I’ve got twelve years of stories and ideas that I’d love to see published. I will be submitting to Platinum Studios after issue #3 is published. They discovered Men In Black and a few other comics so maybe there is room for one more. They are looking for good ideas to pitch to movie studios. The comic doesn’t have to have spectacular artwork like Michael Turner or phenomenal writing by Garth Ennis. They are looking for a good concept that can be expanded into a movie. I’ve also started listing much of my personal collection on my site. I may go the eBay route in selling over 35,000 comics. So this may generate some income as well as some advertising in my eBay listings. Derek McCaw: Would you characterize this as a science fiction book, or would you be willing to call CiCi a superhero? Why or why not? Parker Smart: I would like CiCi to be known as a science fiction book. I plan on introducing more of the technology. On the other hand CiCi will feel the need to help others with her new found powers, but she also has to discover her new powers as well. And she has superhuman abilities as a result of this symbiosis with the nanenes. She can’t solve all of the problems in the world, but as the new villains are introduced she will definitely have a role in bringing them to justice. I have done quite a bit of research for the project and I feel that the next series will be more true to my vision. I wanted to let the artists have fun with it and not be bogged down in what I had to say. Her transformation sequences really should be a lot different. The majority of the nanenes live inside her, not just in her cross. So they should produce the costume through the skin and not just wrap around it. Well, I’m sure since Witchblade came out they used that transformation as inspiration and it seemed to work because that’s what people are used to. But it really should look more viral, like a fast spreading disease that spreads exponentially rather than a shell that wraps around her. I will probably have to provide better reference the next time around. Derek McCaw: Forget the critics for a moment. How has your fan response been? What about other professionals? Parker Smart: The fans… People that would actually pull the book off the shelf are sending in GREAT reviews. They like the artwork and they are surprised that the story is as good as it is. I guess there is some stigma about the way a comic looks (being independent) and the way it reads. When I was in San Diego two guys came by and they were completely nuts about the book. Asking great questions and one guy said that he felt that the Garbage Collector scene in issue #1 was all happening inside the computer in a virtual world. It was indeed happening in the physical world, but that was cool that it could be interpreted either way. They asked so many great questions that I shared a few of my characters that I’d like to introduce later. They promised not to tell anybody and hoped that they would see them soon. Also in San Diego I got more and more artists coming by the booth that wanted to draw CiCi. Of course I had to tell them that I was looking for pinups for the site, but no ongoing stuff until the series was successful. I’ve also gotten good responses from other artists. Again, they are surprised by the story as well. I get people that submit their body of work and I take a look at it. Most haven’t read the book because it’s hard to find in stores. So that’s their homework. They go out and find the book and give it a read. I always ask for honest feedback from people. I’ve had enough of the critics review CiCi that I just don’t take it personally anymore. Well, I guess a little. When I ask for honest feedback I think people are more relieved and they are willing to read the comic for content. Derek McCaw: What books are you reading? Parker Smart: Well I’m not reading anything right now. I just don’t have the time. With my nonexistent budget for comics I still collect all of the Gotham titles, all the Superman titles, Wolverine, Spawn, and Witchblade. I’m sure there are some others but I can’t think of them at the moment. I did finally read Aphrodite IX a few nights ago because somebody said that CiCi was like this robot. Although CiCi is flesh and blood, but I guess Aphrodite is as well. Parker Smart: I would love to see CiCi just take off, but at the moment I’m not seeing that. For the shops that did take a chance and ordered a few books they’ve seen them go off their shelves. I didn’t really see my numbers increase so I don’t think that retailers are that confident of the title. In this market it all has to come from the fans. So if the fans don’t know about the comic, then they’re not going to ask for it. I’m hoping that it’s just that people really don’t know CiCi is out there. Wizard will be helping me out in that department. They are taking a look at it for their Wizard Edge (in January). I’d hope that there is enough interest to have a little blurb in the mainstream Wizard magazine. My initial hope with bringing the big artists on the covers would generate some “news” and I’d get some “free” marketing from bringing these guys on the project. We’ll see what Wizard thinks. There’s plenty of room for reorders though, and if there is enough interest I’d like to be able to print a trade paperback. People tell me that’s where you make your money back. Right now I’d like to stay with the one title. I think there will be enough variety and more characters introduced in the book that I will stay focused. Once there are enough characters they might deserve their own book, but that’s down the road a bit. OK, ok, I’ll spill some of it… Another character that CiCi will stumble across will be somebody that has been frozen. CiCi saves her by introducing some of her nanenes into her bloodstream. They eventually will talk about their situation and more about souls and where they go (if they exist) when somebody is frozen. I’m not saying I’ve got all the answers, but I’d hope it would allow people to think about this a little. Yeah, there are quite a few other characters and villains but I can’t really spill them right now. It might be a while before they are in print so I’d hate to “spill it” and then it might be a year before you see them. Derek McCaw: I’d call Comic-Con a feeding frenzy for Hollywood. How have the bites been for you, and if CiCi were picked up, what would your hopes be for it in another medium? Parker Smart: ANY other medium would be great! The more people see CiCi outside of the comic should create more interest to the comic. I’d like to see her in a full blown feature length film with all the special effects that she (and the nanenes) deserves. No real bites at the moment. I’m hopeful that Platinum will like the idea and really go with it. I feel that I’ve had to deal with so much crap in creating this comic that Karma might be on my side here and some good has got to come my way SOME time. Derek McCaw: Dream cast it for me. Parker Smart: I’d prefer a movie format rather than TV, but isn’t that always the case? 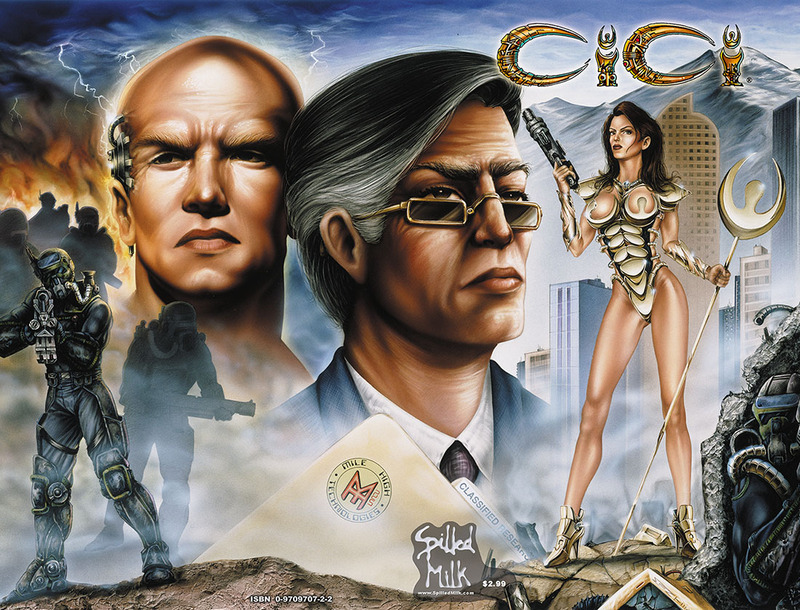 It would be great to see Moore Action Collectibles do a CiCi action figure. I say Moore instead of McFarlane only because I’ve seen better female characters come out of Moore in the past. I haven’t really compared any of the recent stuff so it’s really up for grabs. Derek McCaw: Speaking of DreamCast, how about videogames? Parker Smart: Sure, games would work for me. Since I’ve been playing them for almost 30 years I think I would have some valuable input. Plus, with my programming background I think I could also lend a hand in the code as well. I’d like to see more of an adventure type game like Zelda. You know, those 3rd person games like Ray Man with power-ups and stuff to find and monsters to wail on. I also like RPG’s like Final Fantasy and Skies of Arcadia (if you’re a DreamCast snob). I’m not into the fighting genre. I’m just not very good at those. Too many combos to remember. Maybe with the new controllers I’d be better at it. I remember the old Street Fighter days on the Super NES I got blisters on my thumbs from playing it too hard. It’s definitely not a relaxing game. Not any more. A company did approach me, but they wanted me to invest some money and I wasn’t comfortable about that. Derek McCaw: Any last thoughts for Fanboys everywhere? Parker Smart: Just go buy the book. That’s pretty much implied, right? If you need more convincing you should look at the artwork and some previews out on the website, www.SpilledMilk.com, and see for yourself. Your retailer should have a copy of issue #2 that I gave them for you to look at. Yeah you. You’d think they’d keep it behind the counter for you when you come in. Well… maybe they’ve sold it already. If you’ve already read the book, I’d like to hear from you. Good or bad, I’d like to know. That will be one of the major decision factors on whether or not I can continue. If the interest level isn’t there, then it doesn’t make sense to continue. I look forward to hearing from you. By all means, check out www.spilledmilk.com, and if you like what you see, either ask your retailer or order from Parker. Or maybe buy one of his toys.